Start any road trip with this class C gas motorhome. 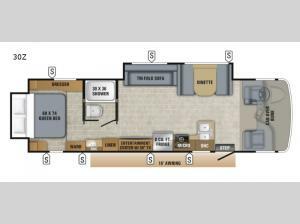 You will love all of the at-home features throughout from the rear queen bed slide out and dresser in the private bedroom, the split bath's location and convenience, and the entertainment center including a 50" TV in the main living area. You can relax on the tri-fold sofa, dine at the booth dinette, and sleep on these furnishings once folded down. The cab-over bunk offers the kids a fun place to sleep. Take a look today and start your next road trip tomorrow!